While CBA was flourishing, I continued my affiliation at the University of Massachusetts. 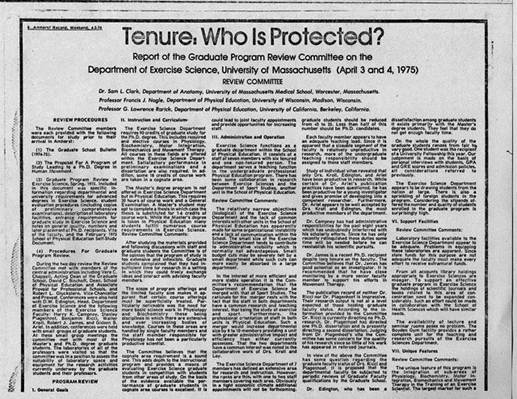 In addition to the classes I attended in Computer Science and the Cybernetics departments, I was also an assistant professor in the department of Exercise Science. I had previously been approached by the Head of the Exercise Science department, Dr. Harry Campney, about a teaching position. His goal was to introduce undergraduate and graduate students to the work I was doing in biomechanics. One of his concerns was that after students graduated, they would need to find jobs. Based on his experiences, as well as, on trends at that time, there were fewer academic positions in “pure” fields such as only physiology or only biomechanics. Dr. Campney was confronted with the need to educate and train students who would be sufficiently diverse to have dual academic appointments or even leave the university to find employment in business settings. He recognized that my experiences might open opportunities and he wanted me to teach classes which bridged the disciplines which was what I was actually doing in my life and business. I had successfully straddled the world of academics and of business. Some of my success was that I had surrounded myself with brilliant and hard workers. But a great portion of credit goes to the fact that I had found a niche where the information I studied -- biomechanics, engineering, computer sciences --- were very much in need. People and companies wanted the benefit of what I and the CBA Company provided to improve the efficiency of their products or their personal performances. Unfortunately, Dr. Campney’s positive attitude and forward-thinking vision was not shared by everyone. For some peculiar reason, my professors and mentors in Physiology and in Biomechanics, Drs. Ricci and Plagenhoef, felt otherwise. They were opposed to my academic-business connection. I had thought that the purpose of a university was to expose and teach students. Then, the students could use this knowledge and integrate it into their lives, or business, or become teachers. Drs. Ricci and Plagenhoef disagreed with my philosophy. Their animosity had its seeds in a surprising, for me, encounter with my advisor, Dr. Ricci. He had summonsed me to his office and told me that I needed to be careful about mixing business with my school work. I responded that I could not see a problem since I was supposed to be learning how to build a successful life. For me, part of that life was to build a successful business, so I was confused how this conflicted with academia. “Think about it,” Dr. Ricci replied. The issue and the meeting with Dr. Ricci confused me. I was aware that some departments, Chemistry, Physics, and Food Technology to name a few, could not exist without support from external financial assistance such as grants from industry. Significant portions of the salaries of my professors in the Computer Science Department were derived from similar grant monies. I could not see how academic was contaminated by grants subsidies from outside the university. Even if one argued that a business grant might cause a researcher to bias any research findings, how could I bias myself? I had my own company which provided a huge advantage to some of my fellow academicians since I could pursue research interest of my own since I had the finances to fund them. From that perspective, business was what helped our learning centers to thrive. Furthermore, I wondered how Dr. Ricci was able to condemn my business when Dr. Plagenhoef was doing the same thing. Dr. Plagenhoef had many outside business ventures and he merely pocketed what he earned. In addition, he used all of the university facilities as well as the students. There was a tongue-in-cheek joke that graduate students did the work and the professors got the money and the glory. At least at CBA, when we had students work on projects for which we were receiving payment, we paid them a reasonable amount of money for the effort they provided. The next surprise came when Professor Ricci called Ann into his office. She had no idea why he wanted to see her, but since he was one of older faculty members, he was able to command attention especially from young, inexperienced graduate students. “Why? What do you mean?” she responded. “Biomechanics is an academic study. We should not take this knowledge and use it to make money. It is an academic subject and should stay within the confines of teachers and students.” was Dr. Ricci’s answer. She quietly sat there, confused and pondering Dr. Ricci’s statements. Were these “rules” written somewhere, she wondered. I actually believed that the purpose knowledge was to contribute to society and that scientific discoveries were steps along that path. After all, DNA was discovered in a laboratory and that scientific information was being applied to research as well as business ventures. All of these thoughts were swirling in her head as she sat on the other side of Dr. Ricci’s desk. “Of course I know. What has that got to do with anything?” she responded. Professor Ricci ignored here question and began to rearrange objects on his desk. Ann stood up and left his office. This Professor, whom she had respected, was telling her that we were not doing the right thing. This was completely illogical and was the exact opposite of what we had been taught about science and learning. The foundation of knowledge was to use it and spread it to other. How could what we were doing possibly be construed as contradicting this basic tenet of education. In her heart she knew that we were doing the right thing. The most shocking part of the meeting, however, was his veiled anti-Semitic comment at the end. She came home that afternoon and relayed the detailed conversation of her meeting with Dr. Ricci. I too was upset, shocked, and puzzled. I had grown up in Israel and there is no Jew alive who does not know about anti-Semitism, but here in this small academic town, a town of learned men and women, I had not expected to have to encounter it firsthand. “I suppose,” I said to her, “it is Jewish to try to make money. But one never stops hearing the same nonsense.” Until today, I remain confused about Dr. Ricci’s objections. Did he believe that it was wrong to benefit financially, was it anti-Semitism, had our academic discipline been tarnished by what I had been doing, was he jealous, or was there another reason? At the time, however, I just shook my head with this annoying buzz in my head and told Ann, “The only thing to do is to continue. We will continue to do our work and our projects both at CBA and at the University and hope that Dr. Ricci’s objections will fade. I threw myself into work, as has always been my personality, by attending classes, coordinating CBA projects, teaching the Exercise Science classes, and involving many of these students into real-life projects associated with movement analysis. These projects enhanced the knowledge base of computer programming and applications as well as the actual problems confronting modern businesses. The students who participated in these studies were enthusiastic and derived many benefits from their involvements. Besides the learning value, they also made money and what student does not need money? To my knowledge, I do not think a single student ever dropped out of my class nor missed any sessions except for colds or the flu. They were dedicated students and we produced hundreds of studies and research for companies as well as for publications. Some students participated in on-going CBA projects. Other students created their own projects using our CBA equipment. One young man used the force plate to study hand writing. He discovered that the forces used to write an individual’s name, or signature, created a unique force pattern. The conclusion he reached was that the forces created when signing your name could not be replicated by a forger. It was possible to write on a piece of paper and have the name appear to be identical using a visual comparison. However, it was impossible for someone else to recreate the individual’s force pattern. A bank, for example, could install specialized pen for force pattern detection and eliminate fraudulent check cashing. It could also prevent inebriated people from signing checks! The students shared their research studies with the class members at the end of each semester. They were dedicated students who excited themselves by what they were able to learn. Each of them was amazed by the discoveries that they had made as individuals, by the superior quality of the research, and all of us were better informed by the studies they conducted. Fortunately, all of my students were able to secure jobs when they graduated from the university. These classes and my teaching techniques were unusual and revolutionary. I knew it and they knew it. I knew that I and my attitudes differed from the norm. Dr. Campney had hired me to teach precisely because I was uniquely different. But, I loved my job, the projects, the individual students, and their interesting and amazing progress. Companies came to CBA because my approach to problems was unusual and I was willing to risk alternative thought processes in order to solve a dilemma. I was a perfect example of what today is called “thinking outside of the box”. I had spent my entire life going against the trends, charting my own destiny, and searching for solutions to problems. It did not seem to me to be a flaw in my personality but rather an asset. One of the obstacles was a lawsuit issued by Dr. Ricci against me claiming that I was using University funds, technology, and ideas to develop my projects. “Based upon our elective faculty workload assignment scheme, Professor Ariel was assigned a 1-1-1 relative distribution profile among the Teaching-Research-Service categories. The assigned nature of his workload was because he was on a one-half time appointment in the Department of Exercise Science. His second half was in the Department of Computer Sciences. In the area of teaching, Professor Ariel carried 6.0 student contact hours; his grade distributions were high; his student evaluations were superior. Sadly this document’s was useful for my attorney, David Burres. I had needed to hire an attorney to defend myself in a suit brought by the University which was forced into it by my own professors, Drs. Ricci and Plagenhoef. This report was going to be our part of our first line of defense. One of Professor Ricci’s complaints was that I had received an unlimited grant for use of the computer mainframe at the university center. Professor Conrad Wogrin was the head and administrator of the Computer Science department. I had taken several computer language courses from him in the Computer Science department. He was an excellent teacher and receptive to new ideas and applications for computers. His attitude was that the computer was a new and exciting tool for students and faculty to use and would soon replace most of the pen-and-pencil situations of the past. He saw the future as a new frontier and the computer was going to be one of the primary vehicles for change. At that time, everyone at the university was allocated computer time. I was not unique in receiving time and memory allotments. Teachers, graduate and undergraduate students were assigned computer access codes and given time. The hours of use were billed in what was known as “funny money”. “Funny money” meant that the time, memory, and computing power were provided accordingly with charges enumerated by category but the “financial” information was used for computer science department use for internal evaluations only. 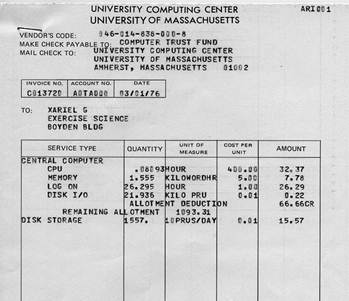 No one was actually presented with an invoice for the use of the University’s computer and expected to pay. Computer time was provided free to all university inhabitants just like the library loaned books at no cost. The day came for the presentation of arguments in the District Court of Northhampton. I was present with my attorney but the two professors who were suing apparently could not be bothered to be present at this momentous occasion. The Judge listened to what the University attorney, who was effectively representing Drs. Ricci and Plagenhoef, had to say. Essentially, the University’s case was that I was using my biomechanical and computer knowledge for my own use. 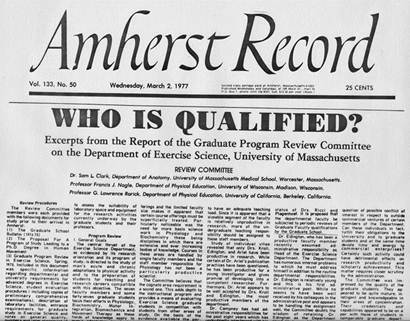 My lawyer argued, that as legitimate student in the Exercise Science department, as well as my other scholastic involvements, coupled with the endorsement from Dr. Wogrin, that I was doing exactly what a creative and scholarly individual was supposed to do. I was an excellent example of what students were to learn and how to perform at a university. Many people in the courtroom began to cheer and clap after the Judge announced his verdict. Although they were happy for me and I was relieved and thrilled by the outcome, it had seriously impacted my life to have been sued by my own professors. In spite of my vindication, I was bothered that neither Dr. Ricci nor Dr. Plagenhoef had come to court. Obviously they had no respect for the court or for their own convictions. They were disrespectful to the system of justice which they had used to fight their own petty battles and then they were too cowardly to accept their loss in public. I was disgusted by them and their behavior. I returned to the university euphoric at having won the case and visited friends and colleagues up and down the corridor. Suddenly I saw Dr. Ricci walking non-schalantly down the hall. I walked down the hall in the same direction that he was going and fell in beside him. With an elevated voice, I told him what a coward he was and that he did not even have the guts to show up in Court. Furthermore, he was a disgrace to the university and to all of humanity! Of course, Dr. Ricci immediately filed another lawsuit against me. This one was for Sureties to Keep the Peace which is less than disturbing the peace but the only one his lawyer could find to file. I was victorious in this case as well, but realized that this kind of nonsense was fun for Dr. Ricci but a waste of time for me. I resolved to stay as far away from him as I could and proceed with doing good and worthwhile things. Entertaining Dr. Ricci in the gutter was a thing of the past for me. Despite any discomfort I might have felt, the local newspapers in Amherst had found a conflict that they could print any number of articles since the story had at least two sides. 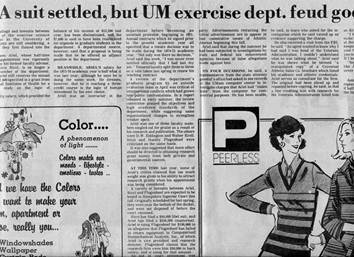 The lawsuits and negative publicity provoked the University into seeking outside evaluation of the Exercise Science Depart. The goal was only slightly veiled with public statements that all the departments were to be evaluated in efforts to determine status, areas for improvements, faculty depth, and other reasons. Sometimes, however, the best of ideas do not work out to produce the positively intended results. An independent panel of evaluators was appointed by the University to evaluate all departments on campus. It was interesting to discover that only one other department was subjected to an internal evaluation. The other department was eventually merged with a larger one. “….The publication record of neither Dr. Ricci nor Plagenhoef is impressive. Their research output is not at a level expected of those holding graduate faculty status. According to the information provided to the Committee, Dr. Ricci is currently not directing any Ph.D. research. Dr. Plagenhoef has directed one Ph.D. dissertation and is presently directing a second dissertation. Judging from Dr. Plagenhoef`s vita, the Committee has some concern for the quality of his research since so little of his work has appeared in refereed journals. After all of the attacks, some subtle and others more public, I was thrilled to read the report of the Graduate Program Review which was the report prepared by the independent review committee. I had been called to the office of the new head of the Exercise Science department, Dr. Dee Eddington. He told me to read the report while he went to lunch. I read the report in the deserted quite of his office and then hurried down the hall to the office to make a quick copy of the report. I left the original report on his desk with a note that it was interesting reading. About a week later, I traveled to Kentucky to a conference which was also attended by several other faculty members from the Exercise Science Department. While I out of town, a miracle occurred! Ann had stayed in Amherst to attend her classes and work at CBA while I was gone. Suddenly, there was a frantic call from Dr. Eddington. He was desperate to determine if I had published the report in the newspaper. Ann told him that I was in Kentucky and could not have been the one responsible for printing the report. She assured him that she was not the one either and had not even seen a copy of the report. She concluded that there must be another individual who wanted the world to know the details printed in the report. Despite having their professionalism questioned, these two professors continued to attack me but they attempted to be more subtle. Rather than focusing on their own research or academic subjects, they concentrated on finding loopholes in mine and attacking me in any way they could find. They continued to launch accusations and, fortunately for me, to lose. It was a waste of money and brain power. The end came when we moved to California. I guess we needed an entire continent to keep us apart. There was a poignant irony to all this. 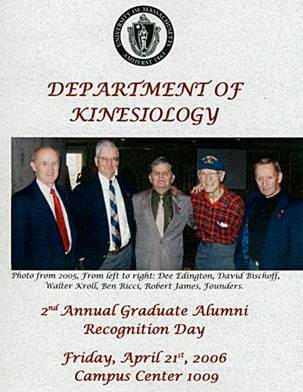 In 2006, thirty six years later, the Department of Exercise Science, which by that time had changed their name to the Department of Kinesiology, selected me for their Graduate Student Achievement Award. It is an honor for me to receive this award for my accomplishment as a student in the Exercise Science Department. Unfortunately, you had to wait for two faculty members to die before you could invite me to this ceremony! However, it is a real honor for me to be present at this occasion tonight and to be given this wonderful award. I want to thank all of you, teachers, colleagues, and students who have honored me by your presence here tonight. It means a lot to me and I sincerely appreciate and thank you. After the presentation, I was surrounded by many of my friends. They were happy at my successes in life and for the award which they all believed was late in coming. 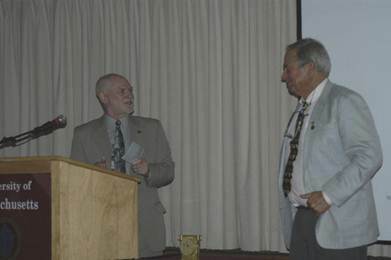 It was a special thrill to be reunited with Dr. Wogrin and for his continued joy at what I had accomplished. I will always remember his inspiration and friendship. In spite of the difficulties which fortunately were small in number when compared with the extraordinarily great number of position things that happened to me during the same years. I had loved my years at Amherst, the projects, the students, the excitement, the opportunities, the learning. I had received my doctorate, met Ann, and started a successful and flourishing business. Yet, I was soon to discover that pettinesses and jealousies were not restricted to academia, but existed everywhere. Now I would have to fight the exercise machine wars and these were as strange as they were robust. Generated on 4/25/2019 12:58:09 AM (PST) ADI/HQ/GBA/2019/ARIELCLOUD/v3.0.2018.0126.